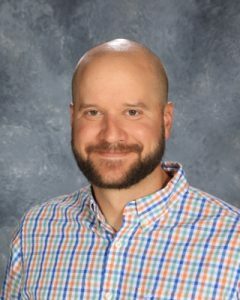 Dan Miller has been named the 2018-2019 assistant principal for Kearney High School (KHS). Miller has been a KHS social studies teacher since 2010, and has been the Social Studies Department Head since 2016. He has spent the past eight years dedicating his career to teaching and coaching the students of this district. “Dan Miller is going to be a great addition to our administrative staff, and we are looking forward to working with him in his new role,” said Dave Schwarzenbach, principal at KHS. Miller began his teaching and coaching career in 2010 when he joined Kearney High School, and through that time he has had the opportunity to develop relationships with parents and students. His knowledge of the district and the community and his work with the students make him a great asset to the administrative team. Miller has served as a baseball and football coach for the Bulldogs since 2010. In 2013 he became the head sponsor for the student council program and still serves as the assistant sponsor for the program. Miller attended Missouri State University where he earned a Bachelor of Science in Education degree. He also holds a Master of Education in Administration degree from William Woods University and continued his education further receiving a Specialist in Education degree from Northwest Missouri State University. Miller was KHS’s nominee for Teacher of the Year for the Northland Regional Chamber Excellence in Education Awards in 2015. He and his wife Nikki have a daughter, Morgan and are expecting their second child in October. Miller will start his new role at the beginning of the 2018-2019 school year. He replaces Brett Coffman, who recently resigned to pursue other opportunities.